Also, there's this bridge that you just KNOW is going to collapse. 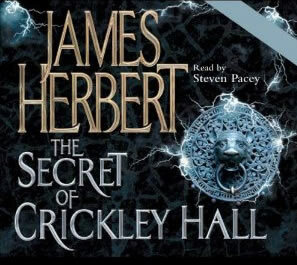 GoodReads lists 'The Secret of Crickley Hall' as a: "a new take on the classic ghost story in the same way that his bestseller Once was a new take on the classic fairy tale" ...and then the rest of the description is wrong, because whoever wrote the synopsis, obviously hasn't read the bloody book properly. A flawed anti-hero, who is always divorced. Because it’s worth mentioning again, terror ramped up to 11. Cross the line...then crossing it again and possibly a 3rd time. Too dumb to live choices made my various characters. I was surprised to find only some of these appeared in Crickley Hall. The main character, whilst described as a troublemaker in his youth, is actually a fairly astute and sensible person, with charm and a sense of humour who cares deeply for his wife and children. This felt a lot different to Herbert’s other works, namely it being almost 5 times as long as most of his earlier books and less focussed on splattering his crapshack world with buckets of gore. Instead, the horror in Crickley Hall is more focussed on things going bump in the night, insane poltergeists and water that you can never clean up. Herbert slaps the detail on though - everything is so precisely described and comprehensive, even more so than his previous works and if you thought he painted a picture before, this time he sets up a projector inside your head and beams it directly into your mind. Another interesting fact is that all the main ‘good’ characters survive the ordeal of Crickley Hall. A possible first for Herbert, who despite playing on the downer moments to maximum effect (one such moment is such a gut-punch, despite somewhat expecting it) he really gives a story of a family that do love and care for one another and this makes the characters feel warm and fleshed-out and like his previous books you root for them on every page. The parts where Herbert delves into the past are the most interesting however. Told as part-flash back by someone I won’t name (spoiler alert) it gives a chilling but vital account of the events before Crickley Hall, the great flood, the treatment of the orphans who died in that flood and the fate of their tormentor. All in all, the group enjoyed the book – comparison was levelled at it to other James Herbert works, with several of us agreeing on the fact, a lot of his books have the same basic structure and premise – but why ruin what is essentially a winning formula? A unanimous thumbs up.